Israel’s collective communities, or kibbutzim, were first established as agricultural projects but have changed significantly over their 100-year history, showing an astute capability to adapt to a dynamic economic environment. Many of them successfully weathered the Israeli economic crisis of the 1980s to develop a solid industrial sector, which as of 2016 accounts for about three-quarters of kibbutz income, while others turned to technology and products, developing profitable businesses. Others still went down the path of sustainable living, developing innovative and environmentally friendly community designs and living methods. Now, the kibbutzim, particularly those in southern Israel, are increasingly looking to high-tech and innovation. “The kibbutz economy has three branches: traditional agriculture, industry, and an emerging branch in high-tech,” says Ofir Libstein, the CEO of the Kibbutz Industry Association (KIA). In order to develop the third branch, the KIA, the Kibbutz Movement, and other groups have in recent years backed education and infrastructure projects in kibbutzim (the Hebrew plural for “kibbutz”) to foster an environment conducive to attracting high-tech companies. Libstein tells NoCamels that kibbutz organizations have actively encouraged the development of the high-tech sector in their communities by supporting various non-profit organizations throughout Israel that aim to teach technical skills, train kibbutz residents for work in high-tech, bring technology companies from Israel’s economic centers to kibbutzim, and serve as incubators for startups. SouthUp is one such organization. Founded in 2015, SouthUp operates in the Sha’ar HaNegev region and seeks to promote “employment, education, and community growth” in kibbutzim near the border with Gaza. SouthUp CEO Elad Yeori founded the first kibbutz incubator for technology companies at Kibbutz Revivim that year. Late last year, SouthUp set up a shared workspace at Kibbutz Nir Am, near Sderot, turning an unused structure into space for startup employees to work. 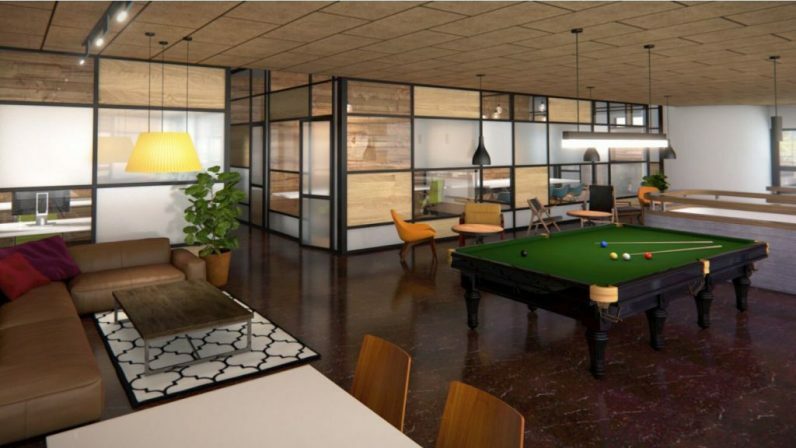 Taking a page from the shared workspace giant WeWork, co-founded by the Israel-born Adam Neumann who spent time on a kibbutz, the SouthUp “Hab,” as the organization calls it, comes complete with a bar, a pool table, work tables and other communal areas, all with a sleek decor. Nir Am’s business administrator Yair Menah tells NoCamels, “We have many young people coming to the kibbutz, studying and working at various startups…We saw the future in this and invested in and made adjustments to a vacant structure we had” – where SouthUp is setting up shop. Menah hopes that these efforts will lead to more development and additional opportunities for kibbutz youth. According to SouthUp, at least 20 kibbutzim in the area are expected to follow suit this year, turning dining halls and unused areas into workspaces for startups taking part in the incubator. SouthUp’s ‘Hab’ at Kibbutz Nir Am. The incubator has so far invested over 20 million shekels (over $5 million) and its investors include an association of private investors, the Jewish Federation of San Diego, and a number of kibbutzim located in the Gaza periphery. Mentors and advisers to the startups are CEOs, entrepreneurs, venture capitalists, and marketing specialists. Startups taking part in the incubator include water management systems firm WATERSIGN, medical cannabis developer RCK, which is a cooperation of the agriculture-based kibbutz Ruhama, the cannabis genetics R&D company Canomix, and professional laboratory Katif, and irrigation technology developer Tevatronic, based in Sderot. SouthUp also has an accelerator program that seeks companies in the fields of agriculture tech, water tech, kibbutz industrial development, energy, chemistry, biology, and software, according to Rafi Nevo, the head of Hamashtela, a fund for promoting technology and innovation in kibbutzim operating under the Kibbutz Movement, and which is partnered with SouthUp. What sets SouthUp apart from other incubators is its requirement for the participating startups to operate from the incubator for two years and remain in the Sha’ar Hanegev region for five years. Startups in the area are also eligible for larger grants from the Israel Innovation Authority. SouthUp also helps its clients find investors through the KIA and San Diego Jewish community. “Companies are expected to gain many opportunities to meet with the significant figures in San Diego and North America, to interest potential investors in their activities, to develop and expand globally and consolidate their independence,” SouthUp says. Nir tells NoCamels that the idea for SouthUp first came from a high school principal worried about the effects of the security situation in southern Israel, whose residents regularly brave rockets launched from Hamas-ruled Gaza, on his young students. Donors from San Diego, Sha’ar HaNegev’s sister city, supported Rothstein’s idea by providing funds to protect the school against rocket attacks and help start SouthUp. Today, these donors are deeply involved in SouthUp’s decision-making and future planning and are “an inseparable part of our operation,” Nir says. SouthUp also fostered key relationships with local educational institutions, partnering with the Sha’ar HaNegev High School for a program that hosts guest lecturers from startups at the school, and with Sha’ar HaNegev’s Sapir College, Israel’s largest public college, for a similar arrangement as well as an internship program and potential employment opportunities. “The people we have here at the startups come to the high school to teach technology, innovation, and entrepreneurship to open students’ minds and develop their creativity,” Nir tells NoCamels, adding that the students who attend Sapir also benefit from the cooperation. “Sapir allows its students to work as employees at companies involved with SouthUp within their fields of study, such as practical engineering and technician work… Students may receive credits in return. This offers them a unique opportunity for long-term employment prospects that we see less in the Tel Aviv area for example.” Moreover, Nevo says, Sapir staff can hold advisory and mentoring positions at SouthUp’s client companies. Finally, SouthUp and Hamashtela can give support to Sapir students and staff who seek to start their own startups. The presence of software company Amdocs in Sha’ar HaNegev since 2001 served as another catalyst for SouthUp, Nir says. “Amdocs brings about 800-900 employees here every day and they do not have the entrepreneurial, innovative environment or ecosystem here in the region.” Amdocs helped found SouthUp and its vice president and head of Sha’ar HaNegev offices, Eyal Fish, is listed as a founder. Amdocs is less involved in SouthUp’s daily operations and their current relationship mostly runs through a separate partnership between Amdocs and Sapir. Nir tells NoCamels that Amdocs is interested in bringing more high-tech enterprises to the area in order to create a stronger “high-tech environment,” indicating that Amdocs and SouthUp may be interested in deepening their relationship. Rothstein, Yadlin, Fish, and Yeori “all worked together to create this special project, which is not a typical technological incubator, but rather really has a vision that technology, innovation, and education are the important things… The goal in one sentence is making innovation, technology, and entrepreneurship accessible to youths and increasing employment here,” Nir says. Through this nascent project, kibbutzim are demonstrating the adaptability of their collective spirit. Whereas the high-tech startups of Tel Aviv must rely mostly on their own efforts to grow, kibbutz leaders, associations, and non-profits like SouthUp are actively seeking out individuals and organizations to support in pursuit of collective development of high-tech in Israel with a focus on kibbutzim. Moreover, kibbutz members are investing in individual startups. As kibbutzim invest more in development of the technology and innovation sector, SouthUp’s technology incubator model will likely play an increasingly important role in helping make the desert a hub for high-tech.